Donna Evans passed away peacefully in her sleep on Saturday, February 2, 2019. She was born April 12, 1927 in Independence, Missouri. The family soon moved to Republic, Missouri, where they resided for several years. It was during this time that she met Carl Evans and their friendship soon blossomed into a romance. Donna moved back to Independence, graduated from William Christman High School and later attended Graceland College in Lamoni, Iowa. Upon returning to Republic, she and Carl married on September 28, 1947. Residing in Republic, Donna held office manager positions for various companies from the Republic Garment Factory to Lee Roberts Chevrolet. Always ready for an adventure, she and Carl traveled extensively after retirement; including two month-long trips through Europe and twenty-five cruises. She was an avid Drury Panthers Booster and looked forward to each basketball season. 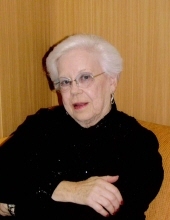 Donna was preceded in death by her mother, Elsie Dillon Haggard, her father, James L. Dillon, and brother James L Dillon, Jr. She is survived by her husband Carl, daughter Cindy Zielonka (Marty) of Houston, TX, son, Steve Evans (Terry) of Springfield, nephew, Jim Evans (Terri) of Springfield, niece, Nancy Johnson (Terry) of Hermitage, Mo and great-niece Melanie Yunger (Casey) of Shawnee, Kansas. It was Donna and Carl’s wish to be intured together. To honor this wish, her cremains will be held and joint service scheduled at the time of Carl’s passing. The family wises to thank the staff at Morningside of Chesterfield Village and Springfield Rehabilitation Health Care Center for their care and compassion. Her memory may be honored with donations to the American Heart Association, American Diabetes Association, and St. Jude's Children Hospital. To send flowers or a remembrance gift to the family of DONNA JEAN EVANS, please visit our Tribute Store. "Email Address" would like to share the life celebration of DONNA JEAN EVANS. Click on the "link" to go to share a favorite memory or leave a condolence message for the family.